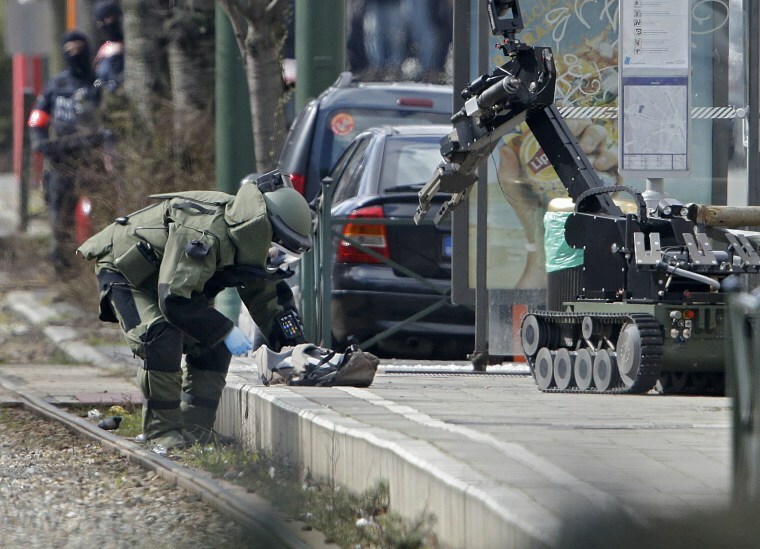 BRUSSELS — Police and troops descended on a Brussels neighborhood where a suspected bomb factory was found earlier this week and arrested one suspect Friday, one of a spate of detentions across Belgium and France over the last two days. The unidentified suspect was arrested at a tram stop in the Schaerbeek area, Belgium's prosecutor said in a statement, adding that the man was wounded in his leg during the operation. Loud bangs were heard in the street and a bomb disposal robot could be seen inspecting an object that was identified by one witness as the suspect's backpack and later blown up by bomb disposal. "The police arrived (from) all over the place," the bystander, Lyna Haddad, told NBC News. "They asked us to get on the floor ... (and) they shot at the man." The arrest was the third carried out by Belgian authorities on Friday. A suspect identified as Tawfik A. was arrested in the Forest municipality of the city, suffering an injury to his leg in the process, and another man named Salah A. was detained in Saint-Gilles, the Belgian prosecutor's office said in a statement Friday. At least two of the raids were "carried out ... under a terrorism file linked to the arrest" of 34-year-old Reda Kriket in Paris on Thursday night, according to the statement. Kriket was sentenced in absentia in July alongside Abdelhamid Abaaoud, the ringleader of the Nov. 13 Paris attacks, according to the Associated Press. On Thursday, seven other suspects were arrested in series of raids in central Brussels, Jette and Schaerbeek in an operation linked to Tuesday's terror attacks. A large portion of the neighborhood was sealed off by masked police past midnight. Locals were blocked from entering their homes and swarms of armed police were on the scene. Some eyewitnesses told The Associated Press they had heard detonations during the operation; police would not answer any questions, though, and after several hours removed a vehicle and took down the cordon after 1 a.m.
De Standaard newspaper reported on Friday that one of the people arrested was man who was seen on security footage next to Khalid El Bakraoui, the suicide attacker who detonated a bomb in the Belgian capital's metro. The federal prosecutor's office did not confirm the arrest and NBC News could not immediately confirm the report. Belgian authorities have been unable to provide a final death toll or even list of nationalities for those affected by the tragedy. Hope was fading for some families searching for loved ones. A senior U.S. official also told NBC News that two Americans had been confirmed dead in the attacks. Two New York-based siblings were also identified as among the fatalities. Belgium raised its threat level to the highest category after Tuesday's suicide bombings. Officials lowered it by one rung to 3 on Thursday. Meanwhile, NBC News' partner ZDF reported that the arrest of a 28-year-old man in Germany may be connected to the Brussels attacks. He was detained after "acting suspiciously" at Giessen train station, which is about 40 miles north of Frankfurt. Two German security sources old ZDF that investigators discovered that three minutes before Khalid El Bakraoui blew himself up in the subway, the suspect had received a text message in French reading "fin" — which means "the end." A second text message from the following day included the name "El Bakraoui." The suspect also had wounds on his back, for which he had been treated in a Brussels hospital on March 18, according to ZDF. That was the day police raided homes in the Molenbeek area of the Belgian capital and captured suspected Paris attacker Salah Abdeslam. Both sources told ZDF that police were now investigating whether the man — who is of Moroccan background — may have been one of two suspects who escaped during that operation. NBC News could not immediately independently verify ZDF's report. Alexander Smith, Annick M'Kele, Andy Eckardt and The Associated Press contributed.